Contest: Win a Limited Edition KitchenAid® Heritage Artisan® Misty Blue Stand Mixer! Win a Limited Edition KitchenAid® Heritage Artisan® Misty Blue Stand Mixer! 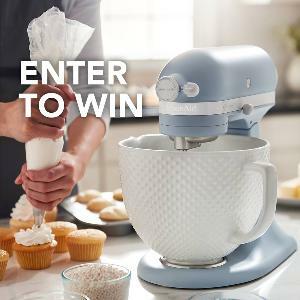 Prize: To celebrate 100 years of KitchenAid, we're giving away 1 Limited Edition Misty Blue Heritage Artisan® Series Model K 5 Quart Tilt-Head Stand Mixer! What you must do to enter: To enter, all you have to do is tell us your favorite kitchen memories on our Facebook post(link is here), join our email list, and connect with Facebook for a chance to win! Statistics: This contest was opened by 79 and entered by 13 ContestChest.com members. 16% of those who opened the contest, entered it.